Jalapeno Popper Stuffed Mushrooms are a delicious twist on a favorite appetizer! 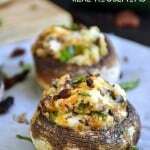 Mushrooms stuffed with a spicy cheese mixture and baked to delicious perfection. Preheat the oven to 350°F and double line a baking sheet with foil. In a skillet over mid-high heat, cook the bacon until well browned and beginning to crisp. Remove from skillet and place on a paper towel lined plate to drain. Allow to cool and then crumble. Set aside until ready to use. Wash and dry the mushrooms. Remove the stems (reserve the caps for stuffing) and finely chop them. Over medium heat, add the chopped mushrooms, 1/2 tablespoon freshly minced garlic, diced jalapeno, and a pinch of salt to the bacon drippings in the skillet. Cook, stirring, until the mushrooms soften and release their juices. This will only take a few minutes. Tip: Use 1 jalapeno for less heat or 2 jalapenos for more heat. I prefer to use 2. Keep in mind jalapenos vary in spiciness. Sometimes I get one that is hot and other times they are quite mild. Adjust the flavor to your liking and the heat level of your jalapeno. Remove from heat and transfer the mushroom mixture to a mixing bowl. Add the cream cheese, 3 tablespoons cheddar cheese, and crumbled bacon into the bowl. Mix well to combine. Add a pinch of salt and pepper and give it a taste. Adjust the seasonings as needed. If it is not spicy enough for you, add more diced jalapenos. Spoon the cheese mixture into the mushroom caps, distributing it evenly. Place each mushroom on the foil lined baking sheet and bake in the preheated oven for about 20 minutes or until you notice the mushrooms releasing their juices and the cheese is melted. They'll start to smell great right about the same time they are ready. Garnish with freshly chopped cilantro if you like and enjoy!